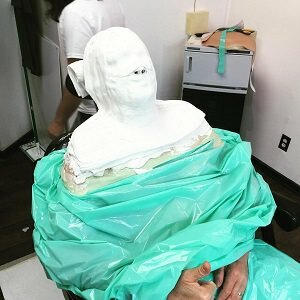 Tony Goldwyn, who plays Fitz on the ABC drama, shared on Instagram this photo of a (what appears to be male) cast member’s head getting fitted for a plaster cast (see photo below). The reasons for such a procedure are few, a frequent one being that the special effects team needs to make a “dummy” head for a stunt scene (e.g. a gruesome gunshot to the noggin; see The Walking Dead‘s Carl). Then again, the purpose could be as benign as creating a bust of exiting President Grant, for display in a museum or some such. Zzzzzz. Or… if we want to go all Mission Impossible on this thing… the special effects folks could be creating a latex mask of the actor, for the purpose of, say, Cyrus “peeling off” his face in the season finale to reveal he is really Billy Chambers! OK, enough (sometimes-silly) speculation by me. Hit the Comments with your own theories on who this (married?) actor is, and why the plaster cast. [Optional] Is Scandal as good now as the first season? Ugh. Shonda Rhimes shows are the worst. So fake and over the top, they aren’t enjoyable because you hate every character she writes. Scandal was amazing in Season 2 actually. IMO that is the best Scandal season. Totally agree. Season 1 was very short anyway. It found its footing by end of season 1 and was awesome in season 2. Each season since then has slowly gone downhill to finally reach the death march it’s at now in my opinion. I can’t believe I still watch this show at this point. I think you got your featured image wrong. The title is “Give Me Head,” but the picture is of Bill Clinton’s WIFE. The man in the photo is most certainly not black. Looks like Cyrus to me. Not sure how I feel about it. I love him, but lately I have been rewatching it from the beginning and realize I forgot all the horrible things he’s done! I think this might be the end of the line for him – rumor has it that Kerry Washington does not like Scott Foley and wants the actor gone. Maybe Shonda obliged. Love the MI reference, maybe Bobby Ewing will be taking a shower, or maybe they’ll wake up and be in bed with Suzanne Pleshette. That Newhart ending was JUST THE BEST. I squeed with delight when I saw SP in bed! Idk. I don’t watch it. Shonda’s shows are awful and should be banned. I’m going with David Rosen for the win. I hope it’s Scott Foley. His character has always been meh, and he’s had nothing to do lately. Actor’s hands in the photo confirm it is a white male. All of the four white guys who are major characters are married in real life so the wedding ring’s not helpful. Based on the current story line, it seems Cyrus and David Rosen will both be key characters going forward. So that leaves Fitz and Jake. 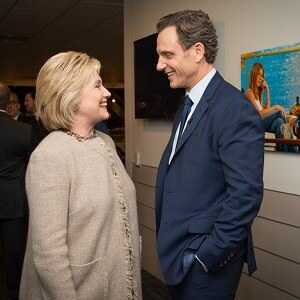 Scott Foley has very slender fingers, so I’m ruling him out and guessing Tony Goldwyn’s Fitz will have the exploding head (but if it’s a dream sequence, it could be any of them). So is Huck not on the table? I think it’s the new PA governor, Vargas, because Scott Foley’s fingers are thinner and Jeff Perry’s and Tony Goldwyn’s wedding rings are different. I hate to sound sooo materialistic but WHAT brand of maternity potato sack is Hillary wearing in that picture?? Why oh why! Scandal-less.